Vladimir Putin can destabilize Ukraine: The Russian president doesn’t need to invade to cause chaos. Vladimir Putin doesn’t need to invade Ukraine. He can destabilize it from the Kremlin. 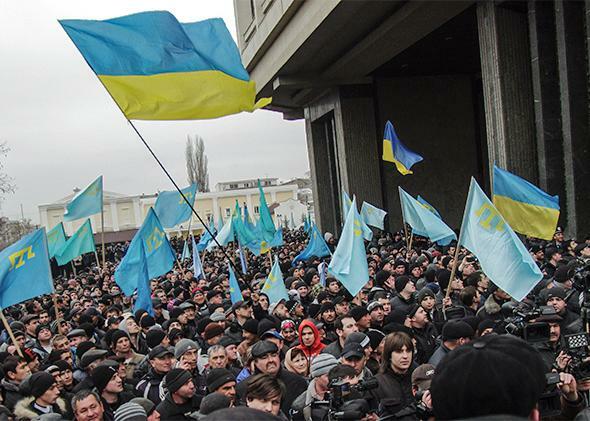 Pro-Ukrainian activists rally in front of the Crimean parliament in Semfiropol on Feb. 26, 2014. The editor of a publication that will remain unnamed called me in recent days wanting to know what I thought: Would Russia invade Ukraine before midnight? She needed to know before her deadline. I didn’t have any inside information, but I guessed: No, I told her, I didn’t think Russia would invade Ukraine—because it did not need to. Since then, armed masked men have occupied the Crimean parliament and raised the Russian flag. But unless the Russian president, Vladimir Putin, suddenly becomes irrational—which of course cannot be excluded, as Russian troops are moving in the area—he must know that a full-scale invasion is entirely unnecessary. After all, he possesses a whole arsenal of nonmilitary tactics that could undermine the new Ukrainian government, many of which have been used successfully in the past. Certainly the organization formerly known as the KGB has some expertise in destabilizing foreign countries, particularly through the use of provokatsiya. One of those non-Slavic words that nevertheless appears in every Slavic language—a prowokacja in Polish, provokace in Czech—a provokatsiya is technically a “provocation.” But it has a narrower meaning as well: a political event or action that the authorities, through their secret services, create to serve their own purposes. A staged crisis; the publication of outrageous documents, authentic or fake; a rapidly organized political movement of the far right or far left; an anonymous bomb explosion—all of these can be provokatsiya. Putin, himself trained in KGB methods, knows all of this very well. Nor will this be the first time that such games have been played in Ukraine. No one has yet explained, for example, why Ukrainian President Viktor Yanukovych not only left Kiev after signing an European Union–brokered treaty last week, but also ordered security guards to abandon all government buildings as well. Was that an unsubtle invitation for the opposition to ransack the offices, so that he could claim he had been chased out by a violent coup? The evolution of Ukraine’s “far right” also bears watching. Although at the moment it is a lot smaller than the far right in France or Holland, I wouldn’t be surprised if it begins to grow: It’s amazing how far the ruble goes in a cash-strapped country. A few Molotov cocktails have already been thrown at synagogues. In the current political environment, it’s important to ask: Did they come from real anti-Semites? From paid agents? From both? Now Crimea is vulnerable to manipulation. In the past, Russian agents have successfully undermined the sovereignty of Georgia by offering Russian passports and other inducements to the residents of South Ossetia, a Georgian province, and then carrying out a de facto invasion. The same kinds of tactics were used to create the semiautonomous province of Transnistria. Technically part of Moldova, Transnistria lives its own post-Soviet life under de facto Russian control. Crimea could become a part of Ukraine that is not really ruled by Ukraine. Clearly, the men with machine guns are not the product of a chaotic social movement, as were the protestors in Kiev. Someone bought them their unmarked uniforms, and somebody planned their carefully timed arrival on the scene. Their presence, coupled with major Russian military exercises in the area, may be intended to encourage separatism. So are the warnings that the Russian media has issued about “fascism” and extremism in Kiev. And if separatists don’t appear in large numbers, then the issue can be used anyway as a constant source of anxiety and tension for the fragile new government in Kiev. Of course economic tools can help wreck that government, too. Two Russian banks have already declared that they will no longer do business in Ukraine, and others may follow. Selective boycotts of particularly vulnerable industries might follow: Ukrainian chocolate exports were blocked last year. The gas supply is harder to play around with—Russian gas goes through Ukraine to other markets in Europe—but the gas price is vulnerable. Russia might also simply decide to wait it out. Ukraine is careening rapidly toward a default: After years of mismanagement, the country’s finances are unsustainable. If Russia simply waits, Ukraine could well go bankrupt and plunge into real economic chaos. The West could lose patience. The Ukrainians who so bravely stood up for independence in the past few months could grow disillusioned with leaders who will be unable to deliver rapid change. That’s what happened after the Orange Revolution in 2005—and in this part of the world, history does repeat itself. There are longer-term tactics available to Putin as well. Russia’s corrupt business elite, together with Ukraine’s corrupt business elite, will certainly try to draw Ukraine’s new leaders into the same web that caught Yanukovych as well as his “pro-Western” predecessors, Yulia Tymoshenko and Viktor Yushchenko. There is a lot of money available to Ukrainian politicians of all sorts who don’t mind being on the Russian payroll, and it’s a lot more money than anybody will get from a State Department “democracy” grant.